Some smartwatches come with powerful processors, lots of storage, and robust software, but have limited capabilities compared to smartphones thanks to their tiny touchscreens. 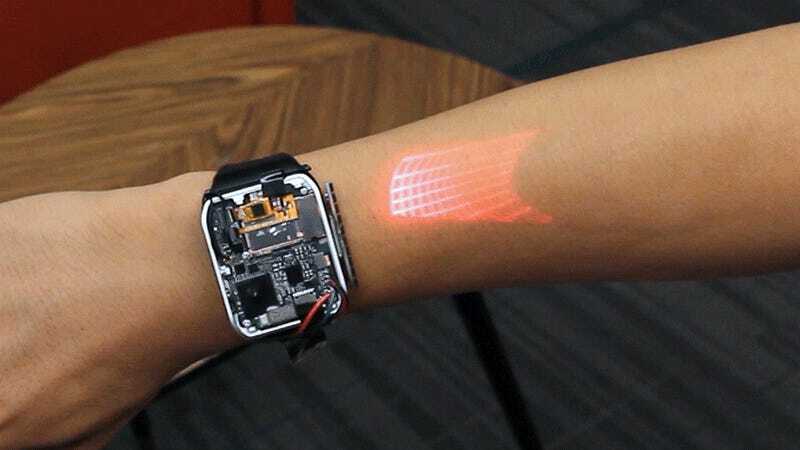 Researchers at Carnegie Mellon University and ASU Tech, however, have now created a smartwatch prototype with a built-in projector that turns the wearer’s arm into a smartphone-sized touchscreen. Despite what you may have seen on crowdfunding sites, the LumiWatch is the first smartwatch to integrate a fully-functional laser projector and sensor array, allowing a screen projected on a user’s skin to be poked, tapped, and swiped just like a traditional touchscreen. It seems like a gadget straight out of science fiction, but don’t reach for your credit card just yet, because it’s going to be a very long time before the technology created for this research project ends up in a consumer-ready device. It might be worth the wait, though. Smartphones have managed to improve their functionality over the years by ballooning to the size of miniature tablets, but a wearable device like a smartwatch will always be limited in size. Imagine strapping a device as small as the original iPhone (tiny by today’s standards) to your wrist: It would feel monstrous on your arm. Smartwatch displays don’t have much room to grow, but at the same time, human fingers aren’t getting any smaller, and interacting with a tiny touchscreen has proven a major disincentive for many would-be adopters of the technology. The LumiWatch is a beefy wearable, there’s no doubt about that. That’s what inspired the researchers at Carnegie Mellon University, who worked with ASU Tech Co. Ltd. in China, to develop the LumiWatch. At 50 millimeters in size, the current prototype is a bit larger than even the 42-millimeter Apple Watch. Instead of a touchscreen, however, it incorporates a 15-lumen pico laser projector, a ten-element sensor array, a quad-core CPU running Android 5.1, and a battery that’s good for an entire day of occasional use, or around an hour of continuous projection. All-in-all, the custom hardware cost around $600, which is actually cheaper than many fancy Wear OS watches. 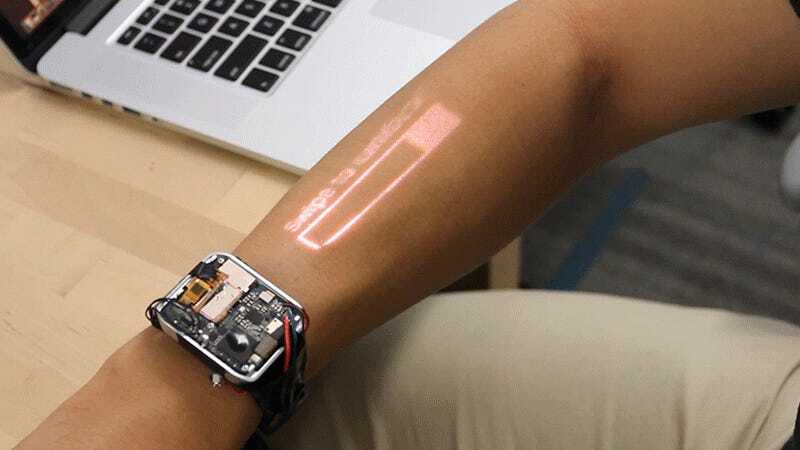 The LumiWatch’s projector is pointed out the side of the watch, creating a 1024×600-pixel image on either the wearer’s arm or the back of their hand. Both orientations work equally well, but stop for a moment and take a look at your arm and hand. Does it look anything like the flat projector screen hanging on the conference room wall at work? Not even close. One of the biggest challenges to making a smartwatch projector isn’t the hardware at this point; it’s projecting an image from a low-angle onto an irregularly curved surface. Correcting distortion on the projected image is one of the important breakthroughs that makes this smartwatch possible. Generating a projected image that isn’t completely deformed by the unique shape of each wearer’s arm is the ‘secret sauce’ behind what makes the LumiWatch more than just a novel tech demo—it’s actually usable. A combination of custom software and graphics-processing hardware removes the image distortion and warping that usually occurs when projecting on an irregular surface, and it also helps ensure the projection is equally bright across the entire length of a user’s arm. Correcting the projected image requires calibration for every user, however, because everyone wears a watch a little differently, and has different physical features. But instead of requiring users to go through an annoying re-calibration procedure every time they want to use the watch, the researchers have resurrected the “swipe to unlock” gesture. The watch’s sensors track the movement of the user’s finger as they swipe the slider, and by tracking the position and changing size of the finger as it moves toward the watch, the calibration calculations can be automatically made. Projectors have always been the most convenient way to create a temporary but large screen, which makes them the ideal way to improve the functionality of smartwatches where you only occasionally want a larger touchscreen. Most of the time I only want to see the time or who’s texting me when when I glance down at my Apple Watch. But in the rare moments when I need to respond to a message, the idea of having a temporary keyboard instantly appearing on my arm is science fiction I want to be science fact as soon as possible. Are you still waiting for the perfect smartwatch? Samsung’s Gear Sport Is Easier to Use Than the Apple Watch, But Where Are My Damn Apps?